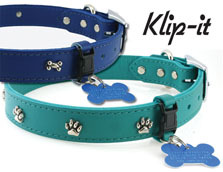 Simply clips on to collar by using the Kwik-Klip buckle. Snaps on and off by pushing a dual-action spring, making it easy to interchange between collars. Now you can remove tags at night for a quiet sleep without any jingling. Great for ID and vaccination tags. The buckles on this Kwik-Klip are tough, but not intended for tie-out use. Available in 11 colors to match your Signature Leather Collars.